It is one of the smallest markets in Europe. In 2012 there were 19.400 units sold, up a healthy 14%. Even if the market is dominated by European carmakers, Asian brands have a higher share than in the rest of Europe. Toyota occupies the second place and its sales advanced a massive 44%, while Hyundai comes at third position, up 51%. VW leads the market with the usual market share (21%), but it didn’t perform as the overall market (due to Skoda’s fall). Honda and Subaru impress with their sales figures (they are in the top 10). Fiat-Chrysler is down in the ranking at # 14, up a good 29% thanks to all of the brands! it is perhaps the only market in the world where all the brands performed very well (Dodge and Chrysler brand stopped selling cars in 2012). The group’s share jumped from 1,5% in 2011 to 1,7% one year later. Nevertheless it is still a small share. 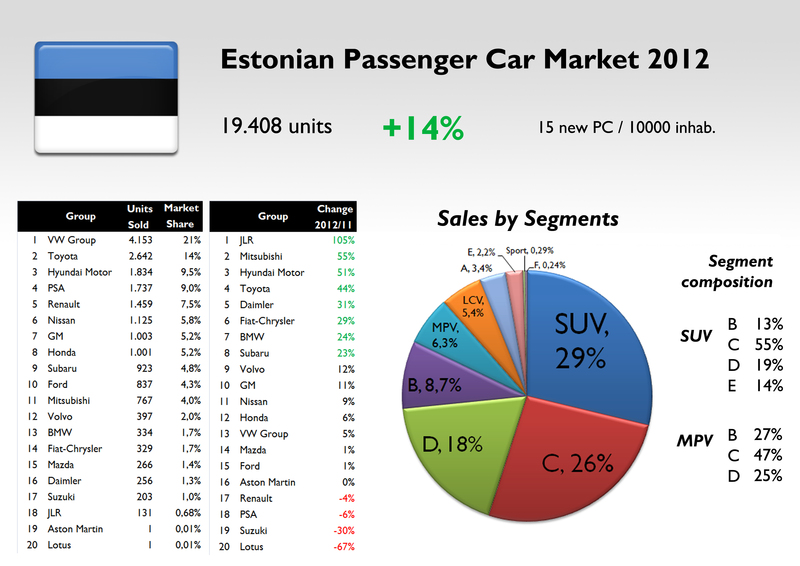 Estonia is one of the few European countries where SUV segment leads the market. In 2012, almost 29% of sales corresponded to SUV of all types. It was closely followed by C-Segment and far behind by D-Segment. In 2012 there were more C-SUV units sold than B-Segment cars sold. This composition reminds the Scandinavian markets (Sweden, Norway), where SUV and big SW (D and E-SW) are highly demanded. Following this trend, the Jeep Grand Cherokee was Fiat-Chrysler best-selling model during 2012. Your analysis is very informative. Sad as it looks, the sales of only 4 Lancia’s in Estonia depicts what is true for the entire region. 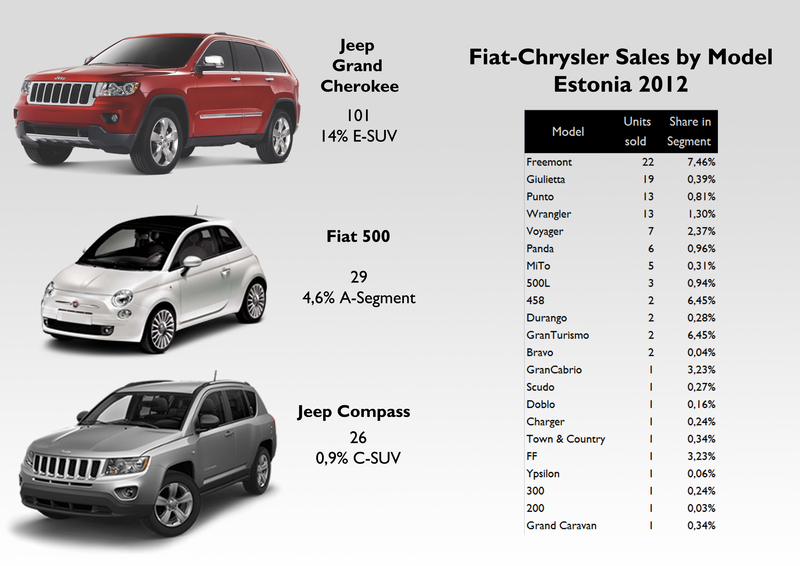 Over the past 2-3 years dealers in most of Scandinavia and the Baltics were deprived of ‘Chrysler-Lancia’ vehicles (except for ‘unofficial imports’) only Jeeps were officially available. I know Estonian dealers just got there first official delivery of Lancias a few months ago, but i don’t know if Latvia, Lithuania or even Finland or Denmark have seen any product yet. In fact Lancia’s website officially only lists Sweden among all Nordic countries. Chrysler once sold thousands of vehicles annually in Scandinavia, hundreds in the Baltics, now under the Lancia brand sales have dropped to a trickle. 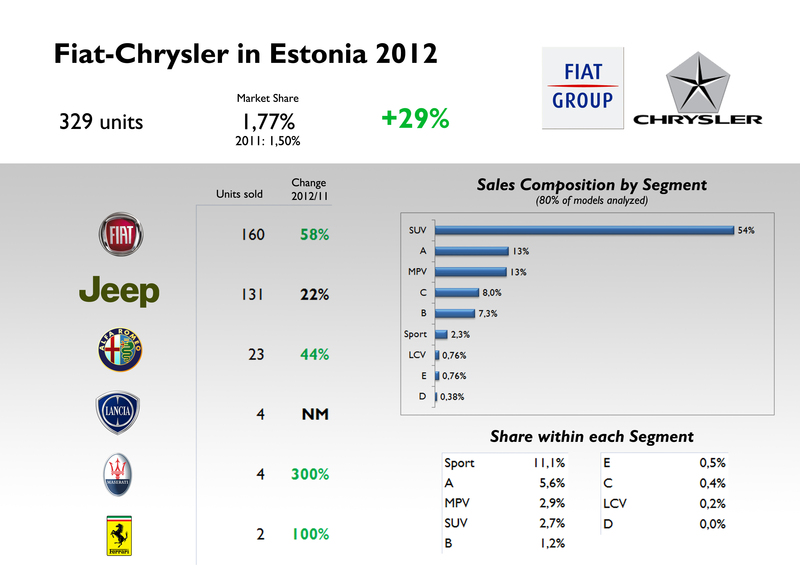 It would be interesting to see an analysis comparing 2007-2010 Chrysler sales to 2011-2013 Lancia sales in various EU markets.